Mickey's faithful dog. Pluto is more than a pet. He and Mickey are bound by strong ties of loyalty. Pluto set out with the others to find his master. Will that famous nose of his lead him to Mickey? The King's faithful dog. But Pluto's more than a pet. He and King Mickey are bound together by the strongest ties there are: friendship and loyalty. When the King disappeared, Pluto set out with the others to find his master. I hope that famous nose of his will lead him to the King. King Mickey's trusty dog. While the King is away, Pluto helps Queen Minnie and Daisy hold down the fort. Well, at least he thinks he's helping. Mickey's canine companion, a faithful friend who gives his master courage and cheers him up in hard times. Mickey's faithful dog. He and Mickey are bound by strong ties of loyalty. 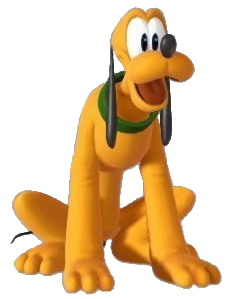 Pluto is King Mickey's loyal pet dog and also appears to be a messenger for him in some Kingdom Hearts games. He debuted in the 1930s animated cartoon The Chain Gang. Pluto was once Mickey's pet in the Country of the Musketeers. Pluto is present when Queen Minnie yells out to Terra, who was running around on the race track in Disney Town. He is also present when Aqua visits the world. While wandering around in Traverse Town, Pluto suddenly stumbles upon a sleeping Sora. Pluto is found by Donald in the throne room of Disney Castle with a letter from the King who has gone missing. Pluto later sleeps during the conversation of options between Queen Minnie, Donald, Goofy, Daisy Duck, and Jiminy Cricket. Donald, Goofy, and Jiminy are sent to locate the King and the Keyblade Wielder. Pluto hops into the Gummi Ship at the last moment as it departs. In Traverse Town, the group witnesses the disappearance of a star and rush off to find Leon. Pluto wanders off into an alleyway, discovering an unconscious Sora. The dog wakes him up with a lick and a sudden shove. Sora asks Pluto where they are, but the dog seems to hear something and rushes off. Pluto suddenly appears out of nowhere with a letter from the King. While on the road, Sora, Donald, and Goofy spot Pluto carrying an envelope with the King's seal. Pluto rushes off, while the three runs after him. However, it appears they lost track of him or gave up due to it being night. The pursuit of Pluto leads the trio to a crossroad, which eventually leads to Castle Oblivion. Pluto shows up to prevent Kairi from going with Axel. Pluto is seen wandering around in The World That Never Was for unknown reasons, although he seems to be tracking Axel. He chases Axel into an alley only to lose him once he enters a Corridor of Darkness, but then Riku, who is wearing a black coat, appears and opens another Corridor of Darkness for him. Pluto arrives on the Destiny Islands just in time to prevent Kairi from going with Axel. Pluto and Kairi escape into Twilight Town where they meet Hayner, Pence, and Olette. Axel soon appears and kidnaps Kairi, and Pluto chases them. Pluto and Kairi end up imprisoned in a cell in the Castle That Never Was. They are rescued by Naminé and escape. They are soon confronted by Saïx, but Riku appears in his disguise as Ansem and chases him off. As Riku is about to leave, Pluto blocks his path and moves Riku in the direction of Kairi, who removes his hood. Pluto disappears until the defeat of Xemnas, leaping into a corridor made by Naminé, which leads to the Destiny Islands. Despite the fact that Kairi, Donald, Goofy, King Mickey, and Pluto passed through the portal to the islands, Pluto was not shown when Sora and Riku returned. Pluto is later on seen with Huey, Dewey, and Louie, Uncle Scrooge, Donald, Goofy, and King Mickey when they return to Disney Castle. When Data-Sora fixes Traverse Town's Bug Blox corruption the Journal shows everyone in Disney Castle's computer the message "Their torment has been lessened" and a scene is shown, where Sora, Donald, and Goofy first meet. The scene shifts to show Pluto in the background revealing that after the battle against the Guard Armor, Pluto ran off into a Corridor of Darkness. Sora goes to visit a sleeping world of the Country of the Musketeers, where he sees Pluto as Mickey's pet. Pluto happily greets Mickey when he returns to Disney Castle after Xehanort's defeat. Pluto is a dog that bears a vague resemblance to a blood hound, particularly in his long, black, droopy ears. He has short, yellow fur and large, close-set eyes. He has three toes on each paw. Pluto's long tail is very thin and black, more closely resembling his master Mickey's tail than that of a dog. His collar is green and loose. Pluto is Mickey's loyal friend. Although he does not appear often with his master, their friendship is easily seen. In Kingdom Hearts II, Pluto is shown to take a liking to Kairi, and becomes her source of comfort. When Axel kidnaps Kairi, Pluto pursues the two through a Corridor of Darkness, and later comforts her while they were locked in the Castle's basement. Being a dog, Pluto has naturally heightened senses, allowing him to sniff out and detect people or objects. Pluto appears in Kingdom Hearts Re:Chain of Memories as a friend card in Sora's story. Activating a Pluto card causes him to dig up prizes such as health points, Moogle points, and even cards for Sora to use in battle. When stocked in twos or threes, the Lucky Bounty sleight is created, offering better prizes with each level. The Pluto card doesn't take up a slot in Sora's three friend capacity; however, it is uncommon to find. Pluto may dig up previously used item cards, ready to be used again, or a bone that causes damage to Sora. Cards dug up during Lucky Bounty that aren't owned by Sora disappear after battle. Pluto, while not actually named, first appeared in the 1930 Disney animated short The Chain Gang. In the short, Mickey attempts to escape from jail after tiring of smashing rocks under Pete's command. Mickey manages to escape, but is caught by police dogs, one of them greatly resembling Pluto, and is taken back to jail. He later appeared as Mickey's dog in the 1930 short, The Picnic, under the name Rover, and finally debuted as Pluto in the 1931 short, The Moose Hunt. The contents of the letter in Pluto's mouth at the end of Kingdom Hearts and beginning of Kingdom Hearts Chain of Memories are still unknown.